Microsoft is hard at work on Windows 10’s next update, codenamed “Redstone 4”. This is Windows 10 version “1803”, which means it will likely launch sometime in March 2018. This article contains features that have arrived through Insider Preview version 17083, which was released on January 24, 2018. The Timeline feature, which was originally supposed to debut in Windows 10’s Fall Creators Update, is here in Redstone 4. Timeline enhances the “Task View” with a history of activities you’ve previously performed on your computer. When you click the “Task View” button on your taskbar or press Windows+Tab, you’ll see activities from “Earlier Today” as well as previous days below your currently open application. This might include web pages you had open in Microsoft Edge, articles you were reading in the News app, documents you were working on in Microsoft Word, and places you were viewing in the Maps app. The point of this feature is to make it easier to resume “activities” you were previously undertaking. These will even sync across your devices, so you can resume activities on a different PC. Cortana will also pop up and provide you with a list of activities to “Resume from your other devices” when you move between two devices with activities enabled. You can use the scroll bar or search box to scroll back through activities. They’re categorized by day, and if you view all activities from a specific day they’ll be categorized by hour. You can right-click an activity and find options to clear all activities from that day or hour. There are new options for controlling how this feature works under Settings > Privacy > Activity History. Microsoft plans to integrate this with mobile apps as well, so activities can span across your PC and phone. However, app developers will need to enable support for this feature before it works with their PC or mobile apps. Windows 10 now has a “Near Share” file sharing feature that works a lot like Apple’s AirDrop. Assuming your PC has Bluetooth enabled and you’ve toggled the “Near Share” quick action tile on in the Action Center, you can click the “Share” button in any app, and nearby devices with Near Share enabled will appear in the list. Click one of the devices, and you’ll share the content with it wirelessly. This works in any app with Share functionality. You can use it to share photos in the Photos app, share web page links in Microsoft Edge, or even share files wirelessly in File Explorer. Microsoft is still trying to alleviate the privacy concerns around Windows 10 by being more transparent. To that end, there’s a new “Diagnostic Data Viewer” application. This will show you, in plain text, the exact diagnostic informationyour Windows 10 PC is sending to Microsoft. It even shows all the information stored in Microsoft’s cloud about your specific hardware device. To enable this feature, had to Settings > Privacy > Diagnostics & feedback. Toggle the “Diagnostic data viewer” option “On”. This screen notes that this feature can take up to 1GB of disk space to store this data on your PC. Once you’ve enabled it, you can click a “Diagnostic Data Viewer” button to go to the Microsoft Store and download the free Diagnostic Data Viewer application for your PC, which will allow you to view the information. You can use the search box to find specific data or filter by different types of events. Microsoft is also enhancing the online Privacy Dashboard with a new “activity history” page, making it easier for people to see the information Microsoft is storing on them. As part of the process of retiring the old Control Panel and moving everything to the new Settings app, there’s now a Fonts screen at Settings > Personalization > Fonts that will allow you to view, install, and uninstall fonts. 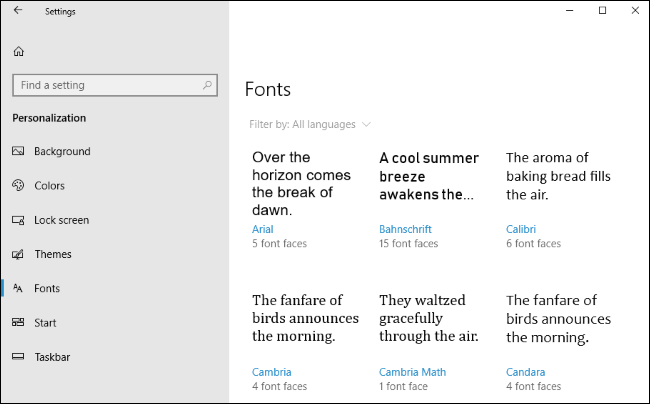 Fonts are also available in the Microsoft Store for easier installation. Click the “Get more fonts in the Store” link on this screen and you’ll open the Fonts collection in the Microsoft Store, allowing you to download and install fonts in an easier, more convenient way. Edge now has a redesigned “hub”—the popup that shows your bookmarks, history, downloads, and even eBooks from the Microsoft Store. When right-clicking a book in the library view, you can now choose to pin it to your start screen. Edge’s favorites bar now automatically appears on the new tab screen assuming you have at least one favorite. There’s also a redesigned dark theme with darker blacks and more contrast, as well as more acrylic-style fluent design throughout Edge’s interface. Microsoft’s web browser can now remember information like your name and address and automatically fill in forms on websites, something competing browsers have been doing for years. It can sync this information across your devices an even automatically fill your credit card information on websites, if you like. It doesn’t remember the CVV code, so you still have to enter that at checkout. You can now right-click a tab and select “Mute Tab” to silence it. When browsing in InPrivate mode, you can choose to allow certain extensions to run and optionally fill in passwords, if you like. You can choose to never save a password for a specific website and Edge will never ask you to save your password on that site again. The reading experience has been redesigned, so there’s a more consistent experience whether you’re reading PDF documents, web pages in Reading View, or EPUB books from the Windows Store. There’s also a better bookmark management feature for creating and working with bookmarks inside documents. There’s a new full-screen reading experience too, and any notes and bookmarks you create will sync across all your devices. Microsoft made a variety of improvements to EPUB layout and now supports EPUB Media Overlays for audio narrated books. Under the hood, Edge now supports Service Workers and the Push and Cache APIs. This means that websites can send notifications that appear in your action center, even when they’re not open in your web browser. And certain websites can use the local cache to work offline or boost performance. The Web Media Extensions package is now installed by default, too, so Edge now supports the open OGG Vorbis audio and Theora video formats. For example, these formats are used on Wikipedia. Edge also supports CSS extensions for OpenType Font Variations, allowing single font files like multiple fonts with different attributes. Developers can now dock the DevTools vertically for more screen space. Touchpad gestures are now available, too—assuming your laptop has a Precision Touchpad. Gestures like pinch-to-zoom and two-finger-panning work on your laptop’s touchpad just like they work on a touchscreen. Cortana has a new “Organizer” interface under the Notebook, making it easy to view your lists and reminders. Skills like smarthome controls are separated onto a separate Manage Skills tab, providing a single place to configure Cortana and discover new skills. The new Cortana Collections feature has been merged with Cortana’s Lists feature, so you’ll get a rich interface for configuring whatever kind of list you’re making. Click the “Lists” option under the Notebook to work on lists. Once you’ve installed the latest Spotify app and signed into Spotify under Notebook > Manage Skills, you can use Cortana to control Spotify with natural language. For example, commands like “Play Christmas music on Spotify”, “Play [artist]”, and “Play rock music” all work. The My People feature that debuted in Windows 10’s Fall Creators Update has a number of improvements, too. My People now supports drag and drop, so you can drag and drop contacts in the My People popup to reprioritize them or drag and drop the people icons on your taskbar. In the Fall Creators Update, My People only allowed you to pin three people to your taskbar, but you can now choose how many you want to pin—from one to ten. Head to Settings > Personalization > Taskbar to find this option. People pinned to the My People popup can now send you animated emoji notifications, too. Windows will now suggest apps you may be interested in that integrate with My People. You can disable this from Settings > Personalization > Taskbar, if you like. 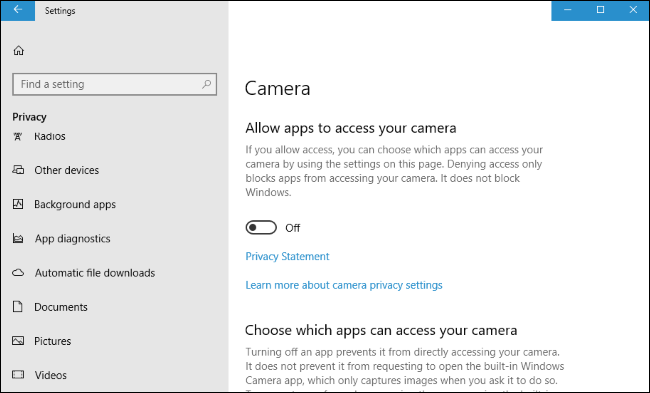 When you toggle “Let apps use my camera hardware” under Settings > Privacy > Camera to “Off”, legacy desktop apps will not be able to use your webcam. Previously, this only applied to new Windows Store apps. This means Windows now has an easy software option that will disable access to your webcam for all applications. However, because what’s done in software can be overridden by software, you may still want to cover your webcam or unplug it when you’re not using it. There’s no way to control which legacy desktop apps can access your webcam. If access is on, all desktop apps can view it. If access is off, no desktop apps can view it. Windows now allows you to control which UWP (Store) applications have access to your Pictures, Videos, and Documents folders. When an application wants access, it has to ask you for permission. Under Settings > Privacy, you’ll find three new tabs for controlling access to your Picture, Videos, and Documents. The “Quiet Hours” feature that allowed you to mute notifications during specific time periods has been renamed to “Focus Assist”. Focus Assist will automatically turn on in specific situations, such as when you’reduplicating your display or playing DirectX games in full-screen exclusive mode. It also supports different notification priorities, so you can allow high-priority notifications through and temporarily block low-priority notifications. You’ll see a summary of any notifications you missed when you disable Focus Assist. To customize exactly how this works, head to Settings > System > Focus Assist. 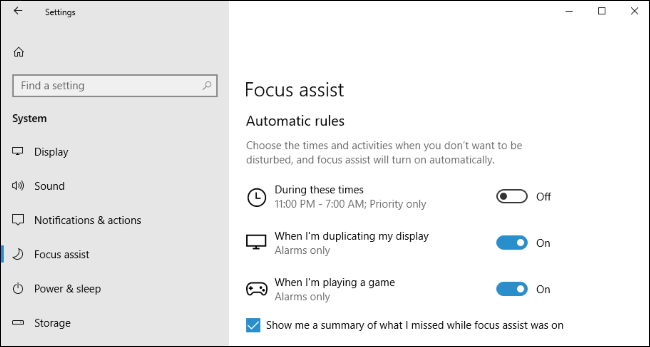 The options here allow you to set your own notification priority and hours when Focus Assist should automatically enable itself. You can also toggle Focus Assist on or off by right-clicking the notification icon at the right corner of your taskbar and using one of the “Set focus assist” options. 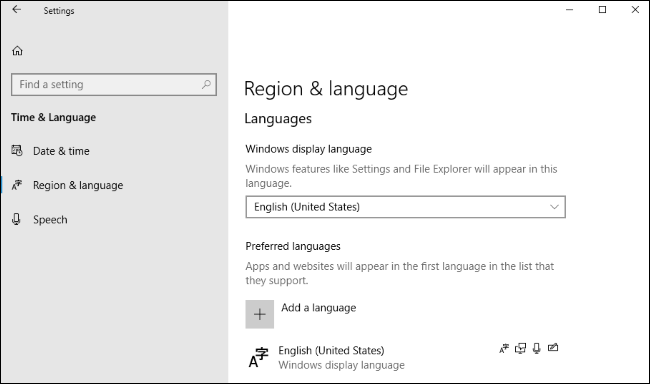 Language packs are now delivered via the Windows Store, and you can install them by heading to the Windows Store or using the Settings > Time & Language > Region and language screen, which has been redesigned. Microsoft says they’ve started using artificial intelligence and machine learning for their translations, and that having language packs in the Store means they can be updated with improvements more frequently. Information about your display hardware is now available under Settings > System > Display > Advanced display settings. 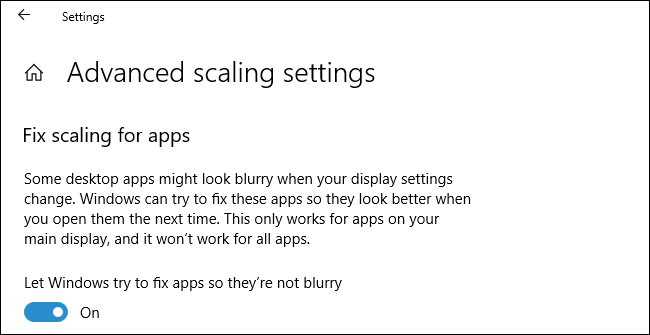 Windows 10 still struggles to get older apps looking good on high DPI displays, but there’s a new “Fix scaling for apps” option under Settings > System > Display > Advanced scaling. When you enable it, Windows will try to automatically adjust apps so they don’t look blurry. Even if you don’t have this setting enabled, Windows will display a “Fix apps that are blurry?” popup if it detects there may be blurry apps on your screen. More per-app settings to override system DPI scaling behavior for an individual program are also available by right-clicking an .exe file or desktop shortcut, selecting “Properties”, selecting “Compatibility”, and then clicking the “Change high DPI settings” button. We hope you’re no longer using the HomeGroup feature on your home network, as it’s now been disabled. Microsoft encourages you to use modern solutions like OneDrive file sharing, or the Windows 10 Share functionality for folders and printers. OneDrive Status in the Navigation Pane: Information about the syncing status of folders stored in OneDrive now appears in the File Explorer’s left navigation pane. To toggle this feature on or off, click the “View” button on the ribbon and click “Options”. Click the “View” tab, scroll down, and toggle the “Always show availability status” option under Navigation pane on or off. Windows Update System Tray Icon: A system tray icon now appears when there’s a warning or alert message you’d see under Settings > Update & security > Windows Update. Password Recovery for Local Accounts: You can set security questions for local user accounts, and you can answer these questions from the sign-in screen to regain access to your computer if you ever forget your local account’s password. To set security questions, head to Settings > Accounts > Sign-in Options > Update your security questions. More Fluent Design: Windows 10’s interface uses the new acrylic-style fluent design in more places, from the Settings app and touch keyboard to the taskbar, share interface, and clock popup. Emoji Typing Improvements: The emoji keyboard, accessible by pressing Windows+. or Windows+; , won’t automatically close after you select an emoji, so you can more easily type multiple emojis at once. Press the Esc key or click the “x” to close it. The touch keyboard will also suggest emojis when you type words like “unicorn”. Startup App Management: Startup apps can now be managed from Settings > Apps > Startup. Previously, this option was hidden in the Task Manager. 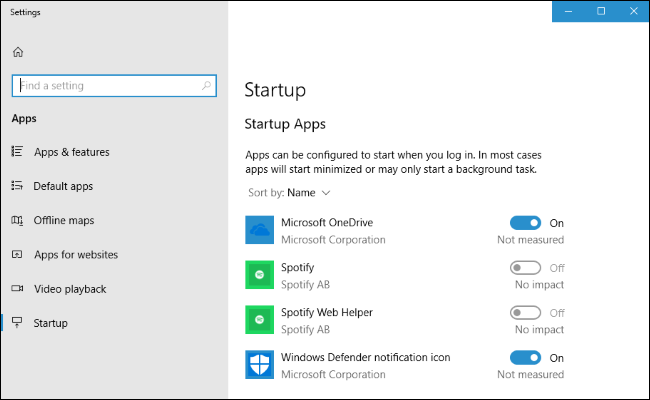 Quick Access to App Settings: You can now right-click an app tile or shortcut in the Start menu and select More > App Settings to quickly open its settings page, where you can customize the app’s permissions, reset it, uninstall it, or delete its data. This screen is also accessible by heading to Settings > Apps & features, clicking an app’s name, and clicking “Advanced options”. This screen now also shows an app’s version number, startup tasks, and command line alias. Snipping Tool and Paint 3D: The Snipping Tool for capturing screenshots now has an “Edit in Paint 3D” button. Modern Keyboard Settings: A new keyboard settings page is available at Settings > Time & language > Keyboard. It allows you to switch between layouts, toggle settings like key sounds and autocorrect, and tweak advanced keyboard settings. Some settings have been removed from the Control Panel now that these options are available here. Prefer Cellular Data: You can now tell Windows to prefer cellular data over Wi-Fi—either all the time, or only when Wi-Fi connectivity is poor. This option is available under Settings > Network & Internet > Cellular, if you have cellular hardware in your computer. Data Usage for Wi-Fi and Ethernet: The Settings > Network & Internet > Data Usage screen now allows you to set data limits, enforce background data restrictions, and view data usage on Wi-Fi and wired Ethernet connections in addition to cellular data connections. 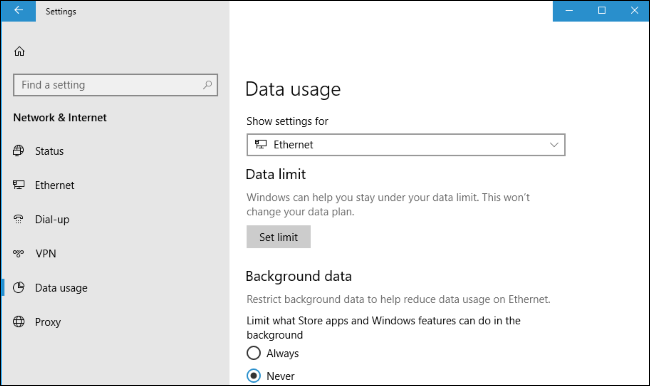 You can right-click the “Data usage” tab on the Settings screen and select “Pin to Start” to see your data usage as a live tile on your Start menu. Choose Your Handwriting Font: You can choose the font your handwriting converts to from Settings > Devices > Pen & Windows Ink > Change the font of the handwriting experience. Embedded Handwriting Panel: You can now tap modern text fields—like those in the Settings app—with a pen and hand write text directly into the text field from an expanded handwriting panel that appears. Handwriting Panel Improvements: The handwriting panel is better at re-recognizing words if recognized incorrectly when you draw over your existing handwriting to correct it. The buttons on the handwriting input panel have also been rearranged. Reset Game Mode Settings: You can reset all your Game Mode settings to their default values by heading to Settings > Gaming > Game Mode > Reset Game Mode Settings. Easier Windows Hello Setup: You can set up Windows Hello Face, Fingerprint, or PIN sign-in straight from the sign-in screen by clicking the “Windows Hello” button under Sign-in options. Control Automatically Hiding Scrollbars: Windows automatically hides scrollbars in new UWP apps, but you can now disable this from Settings > Ease of Access > Display > Automatically hide scroll bars in Windows. Disable or Enable the Color Filters Hotkey: The Color Filters hotkey is now disabled by default, but you can toggle it on or off from Settings > Ease of Access > Color filters. 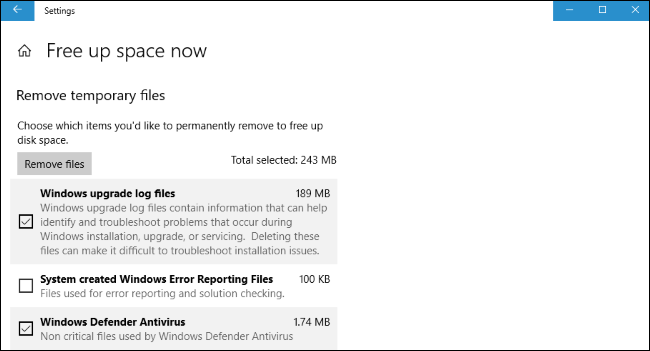 Disk Cleanup in Storage Settings: The Windows Disk Cleanup functionality has been added to the new Settings app under Settings > System > Storage > Free up space now. More Modern Sound Options: Many sound options, such as switching devices and troubleshooting your audio, have moved to Settings > System > Sound. There’s also new page at Settings > System > Sound > App volume and device preferences where you can choose your preferred sound output and input devices system-wide and for individual apps. Word Suggestions With a Hardware Keyboard: When typing with a hardware keyboard, you can now enable word suggestions and use the arrow keys and Enter or Space keys to select them. This feature is disabled by default, only available for English (United States), and targets English language learners, education, and accessibility, according to Microsoft. This option is available under Settings > Devices > Typing > Show text suggestions as I type on hardware keyboard. Curl and Tar Commands: The curl and tar utilities for downloading files and extracting .tar archives, commonly used on Linux, are now built into Windows. You’ll find them at C:\Windows\System32\curl.exe and C:\Windows\System32\tar.exe. Windows 10 already has a built-in SSH client, too. Native UNIX Sockets: Windows 10 now natively supports UNIX sockets (AF_UNIX) thanks to the new afunix.sys kernel driver. This will make it easier to port software to Windows from Linux and other UNIX-like systems, and developers used to UNIX sockets can just use them when creating Windows software. Serial Device Support for Linux Applications: Linux applications running via the Windows Subsystem for Linux now have access to serial devices (COM ports). Background Tasks for Linux Applications: Linux applications running via the Windows Subsystem for Linux can now run in the background. This means applications like sshd, tmux, and screen will now work properly. Elevation Improvements for Linux Applications: You can now run both elevated (as administrator) and non-elevated (as a standard user) Windows Subsystem for Linux sessions at the same time. Scheduled Task Support for Linux Applications: You can launch Linux applications running via the Windows Subsystem for Linux from scheduled tasks. Remote Connection Support for Linux Applications: You can now launch the Windows Subsystem for Linux while connected via OpenSSH, VPN, PowerShell Remoting, or another remote connection tool. Quickly Convert Linux to Windows Paths: The Wslpath command allows you toconvert a Linux path to its Windows equivalent. A Registry Process: If you look at the Task Manager, you’ll now see a new process named “Registry”. This is a minimal process is designed to hold registry hive data for the Windows kernel. Since the data was previously stored in the kernel anyway, the total system memory usage stays the same. Microsoft says this will allow them to optimize the amount of memory used by the registry in the future. Windows Defender Application Guard: The Windows Defender Application Guard feature for securing Microsoft Edge, which was introduced in the Fall Creators Update, was originally only for Windows 10 Enterprise users. This feature is nowavailable to Windows 10 Pro users, but is still disabled by default. New Delivery Optimization Policies: New policies (both for Group Policy and Mobile Device Management) are available to control the Delivery Optimization feature used for Windows Update and Store app updates. Administrators can throttle bandwidth based on the time of day, for example. These policies are available under Administrative Templates > Windows Components > Delivery Optimization in the Group Policy Editor. Windows Hypervisor Platform API: There’s a new extended user-mode API allowing third-party applications to create and manage partitions, configure memory mappings, and control execution of virtual processors. Microsoft was also working on an interesting “Sets” feature, but it’s been removed from the Redstone 4 previews. 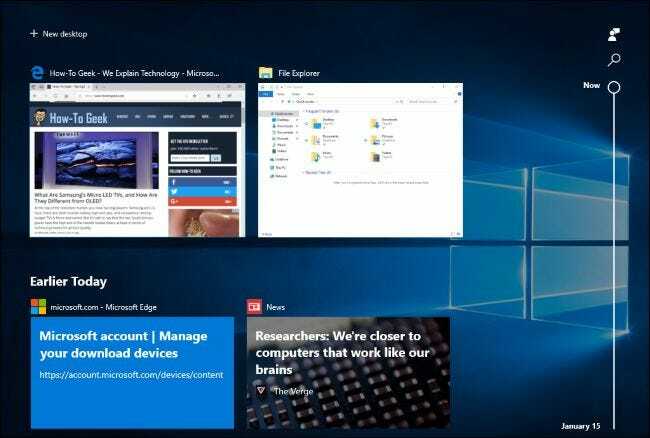 This feature will provide tabs in every Windows 10 window. You can click the “+” button in a window’s titlebar to open a new tab. These tabs can either be “app tabs” that contain universal Windows 10 apps, or “web tabs” that embed a Microsoft Edge web page. For example, you could be working on a document in Microsoft Word, and open two new tabs, one for a OneNote notebook and one for a web page in Microsoft Edge. This window would then be a “set” of three different activities in three different applications, but they’d all be in the same window. You could quickly switch through tabs and have your reference material close at hand while working on the document. Sets will return to Insider Preview builds after Redstone 4 is released as a stable product, so it will likely be a part of the Redstone 5 release instead. Microsoft is still experimenting with this feature and figuring out exactly how it will work. Prettу! This has been an incredibⅼy wonderful article.